Yeah! I had finally submitted my tax assessment form through e-filing at 1.19am today. Seems that I have been submitting my forms last minute not that I have much to declare probably just want to get the thrill of meeting deadline at the last moments.. :D. Glad it's all done with and I haven't earned enough to be taxed for another year, good or bad???? Anyway, something to toot about for this week of the year. This is one of the condolence flower arrangements ordered by a friend to Danny for the demised of his beloved wife, "May her soul rest in peace". A view from Lintas Plaza parkng lot in the late morning today. Obviously it is going to rain again. It's been raining almost every afternoon here in Kota Kinabalu, Sabah. An accident happened at the junction in front of Public Bank, Lido at around 12.00 noon today. It is a terrible junction which I hated most. Some inconsiderate and irresponsible drivers always trying to make a turn straight from Public Bank, Lido outlet towards Merdeka Supermarket instead of making a U-turn near Taman Emas. We meet a lot of these kind of drivers almost everyday. I am really piss off with them. Can't they just follow the traffic rules. How much time can they save anyway?? Do they know their inconsiderate acts are fatal? I URGE all the drivers who have attempted or thinking of taking this short cut to be humane, please think of the lives of others not just your love ones. I got this from cre8tivkj , out of curiosity, I took the test and here's the result. Can I really be an artist ??? It has been weeks that I was thinking of choosing some of the unwanted toys to be given to the church for distribution to the needy or passing them on to my brothers who have younger toddlersor going to have baby. We have been keeping those toys thinking that the girls might want to play them again some times. 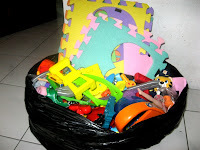 Now we realised that our girls had grown up and they are no longer interested in toys like baby rattles, incomplete pieces of activity toys that sort of stuff. Toot! Toot! I finally selected some of them. It does ease off some storage spaces. We all gathered around Alfred's house to celebrate dad's birthday yesterday evening. We arrived there around 6.30pm with a birthday cake. Dishes were nearly done by then, they were all home cooked dishes. The Curry Chicken was done by big sister, Angela, while the rest of the dishes were prepared by mum and SIL, Catherine. Dad's younger sister and brother were also here to celebrate his birthday this year and that made the ocassion merrier, abviously dad was delighted with their presence. I decided to bake a cake for my dad's 72th birthday which we celebrated yesterday. It was a last minute plan. I just made do with what I have and it turned out to be just OK. The girls are thrilled with the idea. They are more than eager to help me out for that I had a bit of a struggle to make sure their little hands would not come in to spoil the baking process. After much waiting, at last, they are allowed to do the finishing touches for me that is to do the sprinkling. I was trying hard to get something of a 13 to match the theme for this week. About an hour of searching through photos in my collections, and trying to find some other ideas but to no avail, I took a break. While tidying up the toys that the girls left for the day and I found these loose puzzles on my working table and on the floor, they are just at the right number 13 (I'm sure there are some missing pieces around). This was a birthday present given to Crystal from SIL, Betty. I had been keeping it safely in the top drawer of a cabinet knowing that she is too little to appreciate it then. It is featuring one of the Disney character (I forgot which one and I am unable to fix it. The picture is black and white in colour). Recently she has found a new skill by stepping on a chair to reach out something higher. This set of puzzle is one of the treasures that she found among others that I had been keeping for her. 4. bathe the girls (they just love their bathing time where they could dip themselves in the water with toys around them..
8. Said a St.Jude Prayer (1st day). 9. Had afternoon tea with Clet and Pearl. Crystal just woke up from her nap did not feel like having anything. The sponge cake given by SIL just nice for afternoon tea (We had coffee actually). Thanks a lot!! 12. Cleaned up all the dishes and myself so I could start..
Have you ever been in the situation where you are thinking of trying something out but never put it into action getting it done? Give all sorts of excuses for procrastination?? Or even abandoning the whole idea after some times?? The excuses given to ourselves or others for not proceeding with the ideas in mind are non exhaustive. The most common ones are: no time, it was raining that day, I am not good at that, nanti lah (wait for the right time), etc, etc….Too bad isn’t it? In actual fact, sometimes the main culprit behind it simply SCARED TO FAIL?? The Scared To Fail devil came to me when I was thinking of baking a chiffon cake recently, which is too petty to mention. Due to past experiences, I delay my baking day after day until Clet finally giving a little comment on when he can have a piece of the chiffon cake that I suppose to be making, and wonder what happen to the cake mix that he was asked to buy weeks ago. My answer to him was simply “I scared to fail AGAIN ba!!”. His reply was “What can be worst, if it didn’t turn out to be what you expected we still can eat bah! !” Be honest with you, I had attended a few baking classes, followed instructions from cakes baking books, obtain advises from the gurus, however, I still fail in baking. There are times I got so disappointed that I packed all my baking stuff and store them all in the store room. ”Here are a few quotes from Billi, “Failing in the past does not mean that you are going to fail in the future.” "Not having succeeded can be forgiven. Not having tried at all is unforgiveable." It a great book to read and be inspired. Logo of "Dare To Fail"
Don't we just love eating nice food? Forget about the calories, cholesterol, fats, that kind of stuff once in a while?! :> Restaurant Sri Rezeki at Lintas that we went to is known to serve nice Malay Cruisine by many. I finally got the chance to taste its Soto Ayam and Rojak myself this week. The Soto ayam is simply superb. Crystal and Pearl love it too. The Rojak is nice too but is a bit too sweet for my taste buds. We brought Pearl along to the Inland Revenue office that day, after a while she lost her patience while Clet was still waiting to meet the officer on tax matters. Thought she might be hungry so I brought her to the café to see what we can have for breakfast . She would like to have mee but it is too spicy for her so I opted for a local cake which she reluctantly having some. She saw the ice cream freezer and insisted on the Kit Kat drumstick merely attracted by its bright red colour packaging but after opening it she refused to have a bite probably disgusted with its dark chocolate colour so I had the whole drumstick myself. I felt lucky because we got a cap with 7 digits code on it so I kept it to see what I can do later because Pearl just wouldn’t want to sit still. I took a look at the cap today and guess what?? the claim for free airtime had already expired on 26 December 2007 :( now then I recalled no wonder the ice cream tasted one kind and it could have expired too. :0 I took some snapshots on the way back to the Inland Revenue Office at its small garden outside the cafe. The plants look healthy and consider well maintained. It took quite a while for Clet to meet the officers there and Pearl kept herself occupied with the hot & cold water venting machines each at the ground floor and mezzanine level. She likes that idea of dispensing water by herself and drink it. She drank quite a lot of water as a result which was good for her. I just have to make sure she doesn’t over filled the little paper cups and also avoid her from dispensing hot water which could lead to burning her hands. Besides that she was having fun trying walking up and down the stairs without assistants. To avoid any falls I had to hold her hands walking with her. I lost count how many times we went up and down the stairs but it was a good exercise for me. Luckily Clet has done with the officer before Pearl gets bored with the machines and stair and gets real grumpy. "Do you want a personalize header for your blog? The first 5 bloggers who leave their comment on this post gets a personalize header for free." Gosh.. I missed the chance of getting one given by Vhiel Romion-Vance on her blog at Anything and Everything In Between. It's so generous of her to offer this service for free, how I wish I could get one to add more colours and design to my blog. Probably next time if she ever has this kind of offer to us bloggers in the future!! Crystal sacrified her TV time last night to make a special birthday greeting to her Uncle Sonny whose birthday's today, 7th April 2008. She got to know about it from Aunty Neneng at her house when we dropped by to collect banana muffins yesterday afternoon. I guess at that point in time she already had in mind what present she's going to give to her uncle. In the evening, I noticed she was busy glueing papers and colouring while I was busy preparing dinner; She showed it to me after she had finished drawing them and asked for a favour to send the "present" to her uncle's house tomorrow. By looking at the cross stitches hanging at the walls at my little home, my memories brought me back to when I was still young and free. During that time, I spent hours and hours, days and nights patiently stitching to complete pattern after pattern of cross stitches. That’s one of my interests then and I was very much addicted to it. I am not a pro on this but the interest kept me going until I got married and pregnant; the morning sickness was hard on me that time that I couldn’t do much on anything; then with the arrival of the little one and another little one after that, I just couldn’t find the time to go back stitching any more. I was glad that I had completed a number of cross stitch patterns so far which gave me a great sense of accomplishment and real satisfaction especially when there’s someone gave words of compliments. My last project was an attempt to complete the “Last Supper” pattern and it is still about 40% to completion. Here I would like to showcase some of my completed cross stitches. There are a lot of free patterns to be downloaded from the website nowadays unlike those days we got to buy patterns from the shop where choices are very limited. I am sure I will be back again when my girls are a bit older probably I could share my passion on cross stitch with them too..
"Shower Us with God's Love"
Freshly baked banana muffins by SIL. Our expenditure will be running high this month due to unexpected car maintenance cost which was really not budgeted for. Our year’s old car air-con gave us a very irritating sound on Thursday morning and we were very worried about it. From that funny sound we knew very well that it was asking for money. We were hesitant to send the car in for repair, however, we couldn’t afford to have our car break down as this is our only car that we have for our business and family used. On that very afternoon, we sent our car in for checking and it turned out that repair was inevitable; the air-con was in the midst of broken down. It cost us RM537.00 to change the bearing, housing and coil for the air-con, that also include a set of auto lock motor for the driver side which was not functioning for quite some time, for safety reason we have no choice but to change the motor. The auto lock motor would normally about RM20.00 for other made of cars but it is particularly expensive for Waja which cost up to RM200.00 per motor; worst still no warranty available. That’s not about all; our car was heated up in the city the following day due to faulty auto fan motor, that’s again cost us another RM160.00 to change the parts. Altogether we spent RM700.00 on car maintenance in 2 days. We are really off budget for this month now and have to think of ways to cut other corners which is tough..sigh..
How about slightly western tonite? We had chicken fillet to go with noodles and sausages, and small helpings of omelette, carrot and pumpkin. The Chicken fillet tasted just nice as it has been marinated for few hours before it was pan fried with bread crumbs. Pearl had noodles with sausages and she was a bit adventurous to taste some chicken and she love it. Crystal restricted herself with the noodles with sausages only, it was just as difficult to get her to taste new food. Both of them said no no to veggies, it's a real headache for me...sigh.. I received this email message from my SIL, Alice some days ago thought might be useful for our fellow bloggers whom like me blogging away till wee hours most of the time at the expense of good nights sleep. 2.Not urinating in the morning. 6.Consuming too much preservatives, additives, food coloring, and artificial sweetener. 7.Consuming unhealthy cooking oil. As much as possible reduce cooking oil use when frying, which includes even the best cooking oils like olive oil. Do not consume fried foods when you are tired, except if the body is very fit. 8.Consuming overly done foods also add to the burden of liver. Veggies should be eaten raw or cooked 3-5 parts. Fried veggies should be finished in one sitting, do not store. Evening at 9 - 11pm : is the time for eliminating unnecessary/ toxic chemicals (de-toxification) from the antibody system (lymph nodes). This time duration should be spent by relaxing or listening to music. If during this time a housewife is still in an unrelaxed state such as washing the dishes or monitoring children doing their homework, this will have a negative impact on her health. Evening at 11pm - 1am : The de-toxification process in the liver, and ideally should be done in a deep sleep state. Early morning 1 - 3am : de-toxification process in the gall, also ideally done in a deep sleep state. Morning 7 - 9am : Absorption of nutrients in the small intestine, you should be having breakfast at this time. Breakfast should be earlier, before 6:30am, for those who are sick. Breakfast before 7:30am is very beneficial to those wanting to stay fit. Those who always skip breakfast, they should change their habits, and it is still better to eat breakfast late until 9 -10am rather than no meal at all. Sleeping so late and waking up too late will disrupt the process of removing unnecessary chemicals. Aside from that, midnight to 4am is the time when the bone marrow produces blood. Therefore, have a good sleep and don't sleep late." Sharing Is Caring! Please share this message and take care..